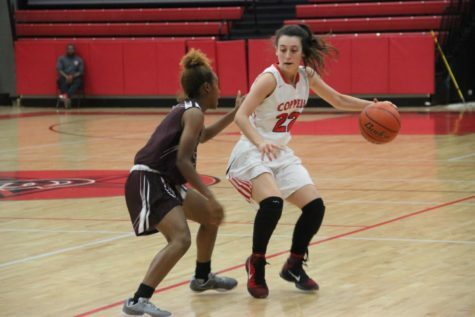 Coppell High School sophomore Megan O’neil dribbles the ball to shoot against Red Oak defence during Tuesday night’s game in CHS arena. 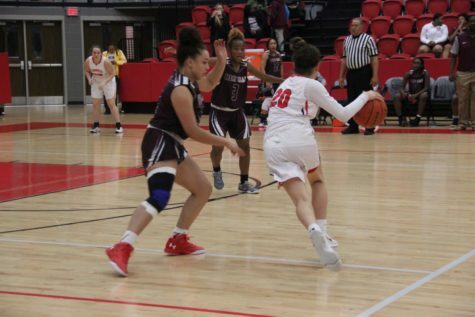 The Cowgirls fell short against Red Oak 47-54. Coppell High School sophomore Kennedi Rogers dribbles and looks to pass the ball against Red Oak during Tuesday night’s game in CHS arena. The Cowgirls first loss of the new season against Red Oak 47-54. 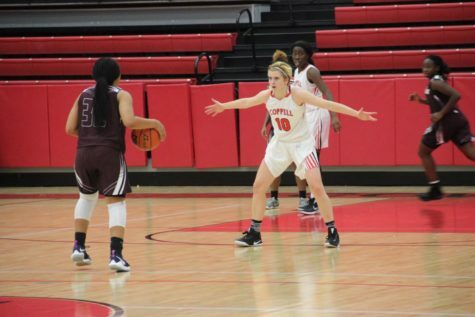 Coppell High School sophomore Jordan Nelson dribbles down the court against Red Oak defence during Tuesday night’s game in CHS arena. 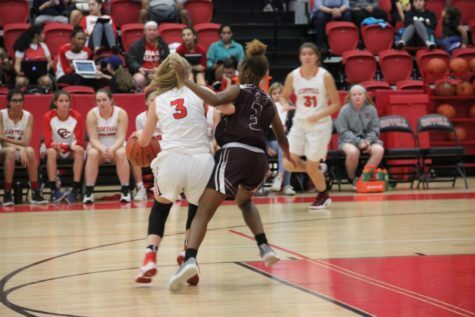 The Cowgirls took a loss against Red Oak 47-54. 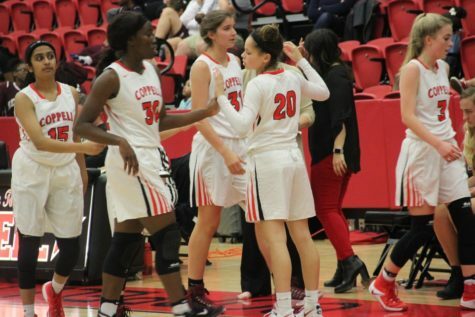 The Coppell High School varsity girls basketball players congratulate each other after coming off the court during Tuesday night’s game at CHS arena. The Cowgirls took a loss against Red Oak 47-54. 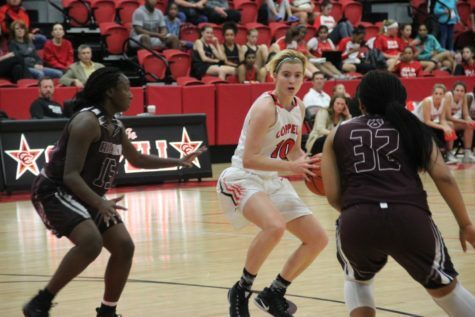 Coppell High School senior Mary Luckett looks to pass the ball against Red Oak defence during Tuesday night’s game in CHS arena. The Cowgirls take a loss for the first game of the season against Red Oak 47-54. 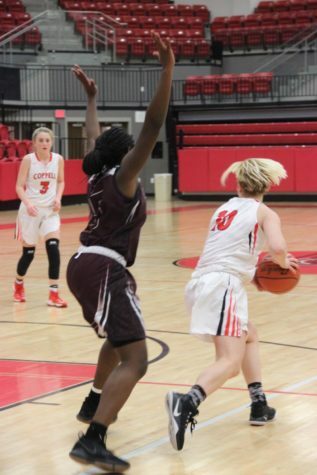 Coppell High School sophomore Nicole Obialo shoots the ball as Red Oak defence blocks the ball during Tuesday night’s game at CHS arena. 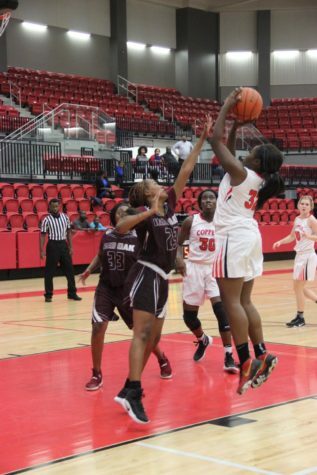 The Cowgirls fall short against Red Oak 47-54. Coppell High School senior Mary Luckett dribbles the ball down the court during Tuesday night’s game at CHS arena. The Cowgirls take a loss the first game of the season against Red Oak 47-54.